Week 172 - Almost 24,000 new documents added so far this month. Almost 24,000 new documents added so far this month. 23,937 brand new Irish company documents have been added to Vision-net.ie so far this month...and our Real-Time service means you're as up-to-date as possible. Already this month we've uploaded almost 1,200 sets of new financial accounts for Irish companies, 1,496 new sets of Annual Returns, 78 Appointment of Liquidator forms and 2,003 Change of Directors. Added to that we've also published details of 44 MOCs and 7 Court Ordered liquidations. Vision-net.ie also gives you access to the almost 2,100 consumer and commercial judgments, worth €165m, that have been registered so far this year. 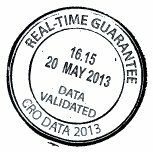 Plus our Real-Time link means you can get information as soon as it's made available in the CRO...just look for our Real-Time stamp. It ensures that you're accessing the very latest live updates, as they're processed in the CRO. There are no delays or waiting lists...just real time data streamed live, directly from source to ensure the most accurate and up-to-date Verification and KYC checks. Why wait until tomorrow when it's ready and waiting on Vision-net.ie today!